The yet untitled film is said to be another romantic breezy entertainer and will have music by Thaman SS. Young actor Akhil Akkineni tasted success with his second film Hello which was directed by Vikram K Kumar. And with his career set on the right path, Akhil is now carefully choosing scripts for his upcoming films. Akhil will now team up with Tholiprema director Venky Atluri who impressed with his debut film that featured Varun Tej and Raashi Khanna. The Akhil-Venky film is yet to be titled and is being produced by BVSN Prasad. The yet untitled film will feature Nidhhi Agrewal as the leading lady and will be her second film in Telugu after Savyasachi starring Akhil’s brother Naga Chaitanya. 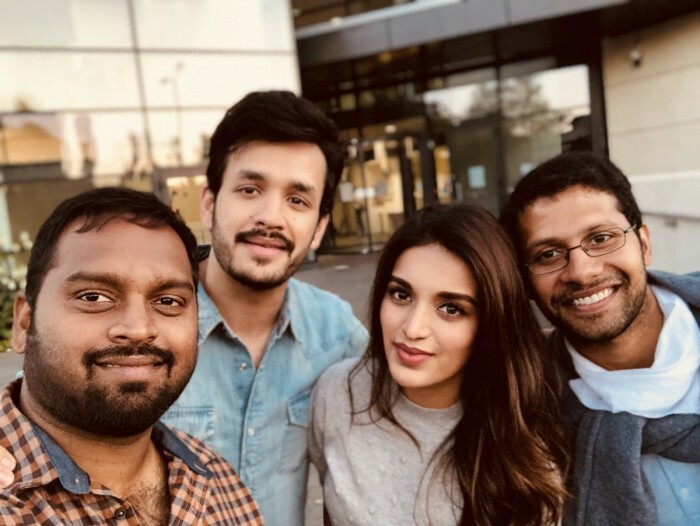 The shooting of the film began yesterday and both Akhil and Nidhhi Agrewal were part of the schedule. Akhil took to his social networking pages and shared a picture from the first day of shoot. The group, Akhil, Nidhhi and Venky Atluri looked happy as they began the shoot. “Off to a good start. Hence the smiles 🙂 fully satisfied……goodnight !” Akhil wrote on his social networking pages. The yet untitled film is said to be another romantic breezy entertainer and will have music by Thaman SS. And according to latest reports, the film may have gotten a title. Reports reveal that Akhil’s film with Venky Atluri is titled Mr Majnu which is yet to be confirmed by the makers. Buzz in Telugu film circles is also that the makers may soon make an official announcement about this. This will be an interesting title because Majnu was title of one of Akhil’s father, Akkineni Nagarjuna’s film, a biggest in his career. Venky Atluri had an impressive start to his career as a director in Tollywood with Tholiprema which impressed everyone including audiences and critics. A romantic drama, Tholiprema starred Varun Tej and Raashi Khanna in the lead roles. And with a terrific debut film under his belt, expectations on this film will be quite high.